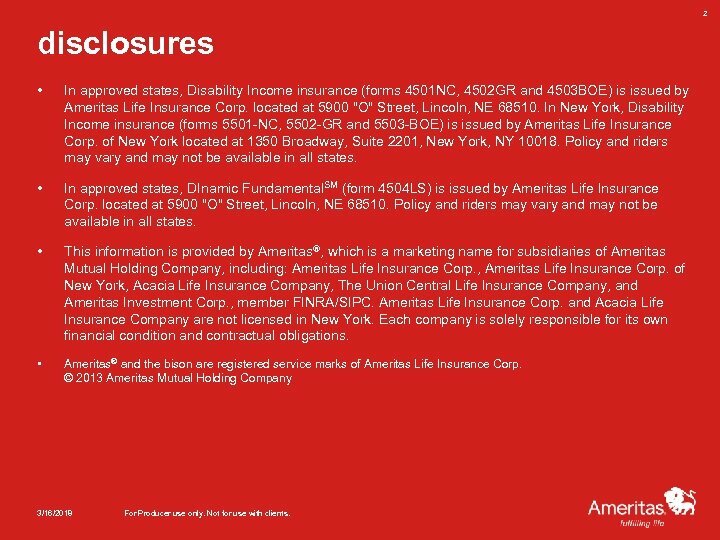 2 disclosures • In approved states, Disability Income insurance (forms 4501 NC, 4502 GR and 4503 BOE) is issued by Ameritas Life Insurance Corp. located at 5900 "O" Street, Lincoln, NE 68510. 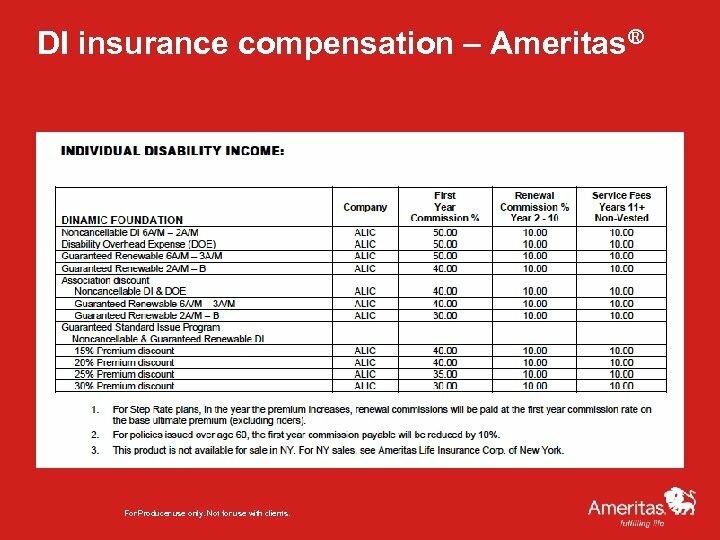 In New York, Disability Income insurance (forms 5501 -NC, 5502 -GR and 5503 -BOE) is issued by Ameritas Life Insurance Corp. of New York located at 1350 Broadway, Suite 2201, New York, NY 10018. Policy and riders may vary and may not be available in all states. • In approved states, DInamic Fundamental. SM (form 4504 LS) is issued by Ameritas Life Insurance Corp. located at 5900 "O" Street, Lincoln, NE 68510. Policy and riders may vary and may not be available in all states. • This information is provided by Ameritas®, which is a marketing name for subsidiaries of Ameritas Mutual Holding Company, including: Ameritas Life Insurance Corp. , Ameritas Life Insurance Corp. of New York, Acacia Life Insurance Company, The Union Central Life Insurance Company, and Ameritas Investment Corp. , member FINRA/SIPC. Ameritas Life Insurance Corp. and Acacia Life Insurance Company are not licensed in New York. Each company is solely responsible for its own financial condition and contractual obligations. • Ameritas® and the bison are registered service marks of Ameritas Life Insurance Corp. © 2013 Ameritas Mutual Holding Company 3/16/2018 For Producer use only. Not for use with clients. 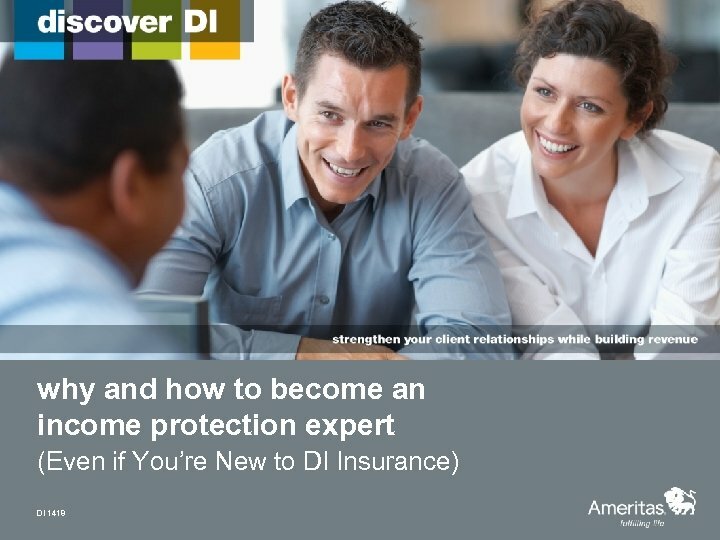 agenda • Why become an income protection expert? 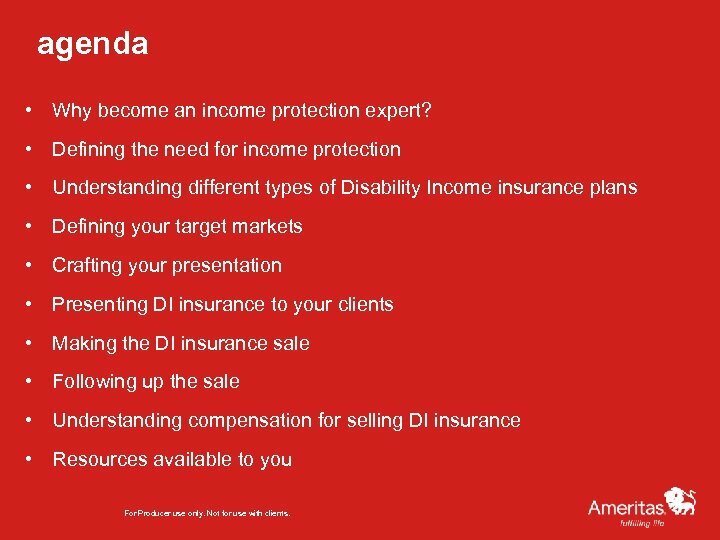 • Defining the need for income protection • Understanding different types of Disability Income insurance plans • Defining your target markets • Crafting your presentation • Presenting DI insurance to your clients • Making the DI insurance sale • Following up the sale • Understanding compensation for selling DI insurance • Resources available to you For Producer use only. Not for use with clients. why become an income protection expert? • Many producers left and haven’t returned • Twenty years ago, over 300 carriers had their own DI insurance product and many others had selling agreements which gave their producers access to a DI insurance product • In the mid- to late 90’s, many carriers left the DI insurance industry • Many producers who have joined the DI insurance industry in the last decade haven’t had sufficient training on the products • The lack of producers actively prospecting with DI insurance provides you significant opportunity For Producer use only. Not for use with clients. 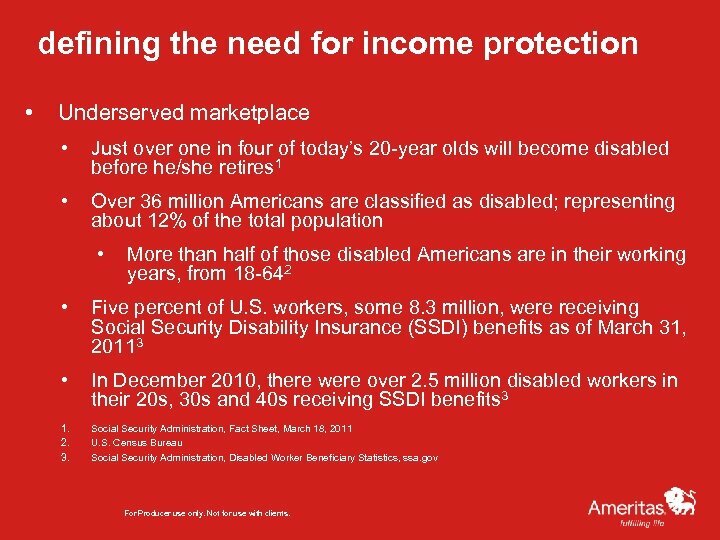 defining the need for income protection • Underserved marketplace • Just over one in four of today’s 20 -year olds will become disabled before he/she retires 1 • Over 36 million Americans are classified as disabled; representing about 12% of the total population • More than half of those disabled Americans are in their working years, from 18 -642 • Five percent of U. S. workers, some 8. 3 million, were receiving Social Security Disability Insurance (SSDI) benefits as of March 31, 20113 • In December 2010, there were over 2. 5 million disabled workers in their 20 s, 30 s and 40 s receiving SSDI benefits 3 1. 2. 3. Social Security Administration, Fact Sheet, March 18, 2011 U. S. Census Bureau Social Security Administration, Disabled Worker Beneficiary Statistics, ssa. gov For Producer use only. Not for use with clients. 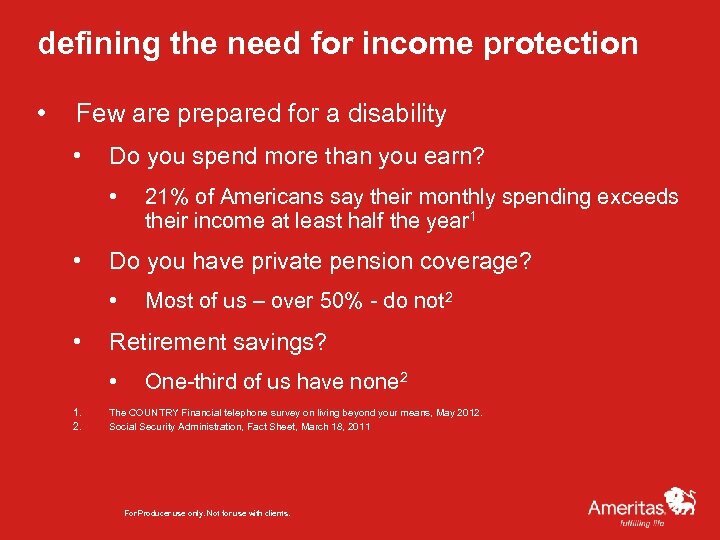 defining the need for income protection • Few are prepared for a disability • Do you spend more than you earn? • • Do you have private pension coverage? • • Most of us – over 50% - do not 2 Retirement savings? • 1. 2. 21% of Americans say their monthly spending exceeds their income at least half the year 1 One-third of us have none 2 The COUNTRY Financial telephone survey on living beyond your means, May 2012. Social Security Administration, Fact Sheet, March 18, 2011 For Producer use only. Not for use with clients. defining the need for income protection • Few are prepared for a disability • 25% of working American families have no savings at all 3 • 71% of Americans would find it very or at least somewhat difficult to meet their current financial obligations if their next paycheck was delayed for one week 4 • 65% of working Americans say they could not cover normal living expenses even for a year if their employment income was lost; 38% couldn’t pay their bills for more than three months 5 3. 4. 5. Federal Reserve, U. S. Census Bureau, Internal Revenue Service, July 26, 2012. 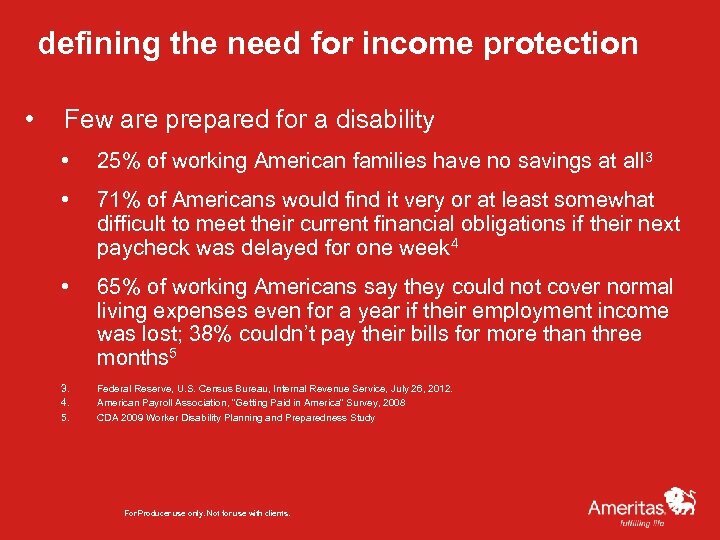 American Payroll Association, “Getting Paid in America” Survey, 2008 CDA 2009 Worker Disability Planning and Preparedness Study For Producer use only. Not for use with clients. 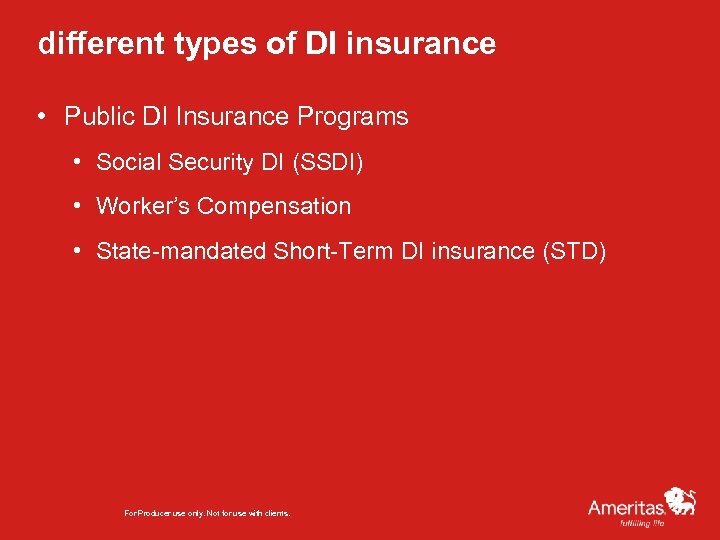 different types of DI insurance • Public DI Insurance Programs • Social Security DI (SSDI) • Worker’s Compensation • State-mandated Short-Term DI insurance (STD) For Producer use only. Not for use with clients. 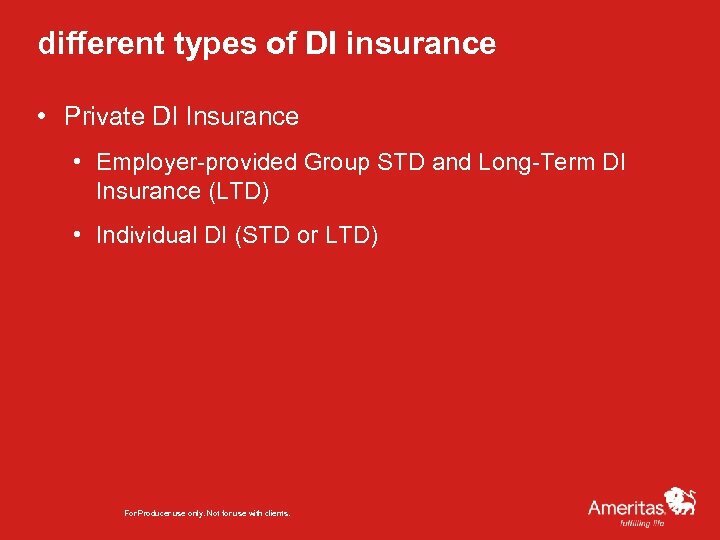 different types of DI insurance • Private DI Insurance • Employer-provided Group STD and Long-Term DI Insurance (LTD) • Individual DI (STD or LTD) For Producer use only. Not for use with clients. 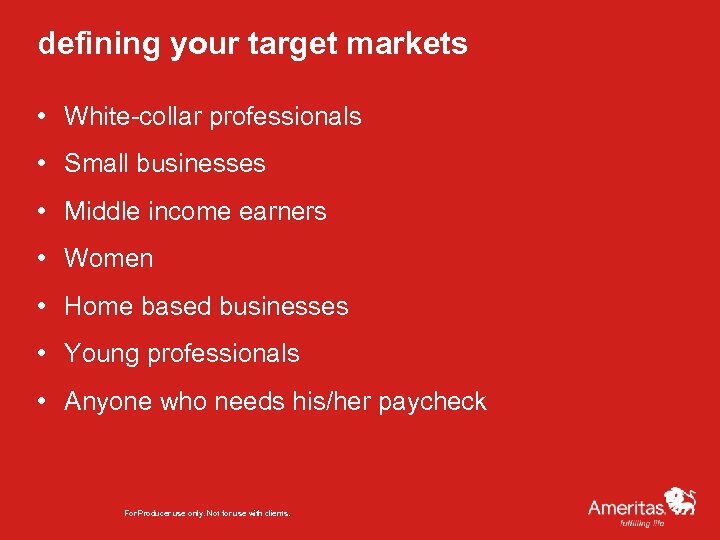 defining your target markets • White-collar professionals • Small businesses • Middle income earners • Women • Home based businesses • Young professionals • Anyone who needs his/her paycheck For Producer use only. Not for use with clients. 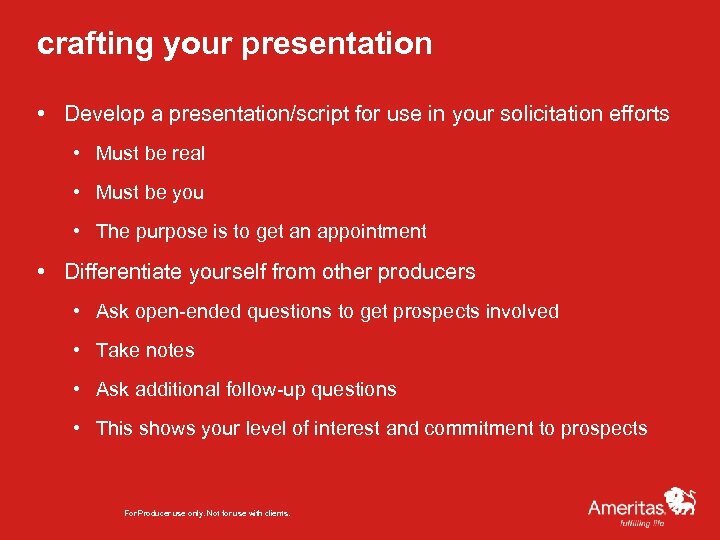 crafting your presentation • Develop a presentation/script for use in your solicitation efforts • Must be real • Must be you • The purpose is to get an appointment • Differentiate yourself from other producers • Ask open-ended questions to get prospects involved • Take notes • Ask additional follow-up questions • This shows your level of interest and commitment to prospects For Producer use only. Not for use with clients. 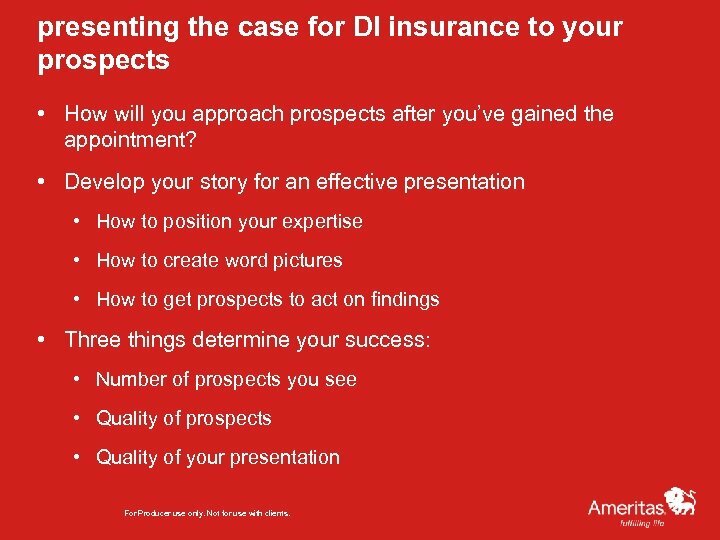 presenting the case for DI insurance to your prospects • How will you approach prospects after you’ve gained the appointment? • Develop your story for an effective presentation • How to position your expertise • How to create word pictures • How to get prospects to act on findings • Three things determine your success: • Number of prospects you see • Quality of prospects • Quality of your presentation For Producer use only. Not for use with clients. 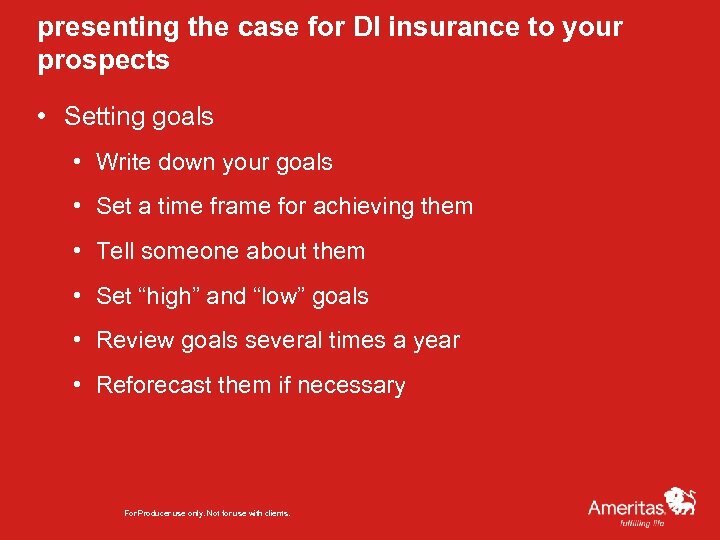 presenting the case for DI insurance to your prospects • Setting goals • Write down your goals • Set a time frame for achieving them • Tell someone about them • Set “high” and “low” goals • Review goals several times a year • Reforecast them if necessary For Producer use only. Not for use with clients. you’ve got the appointment, now what? 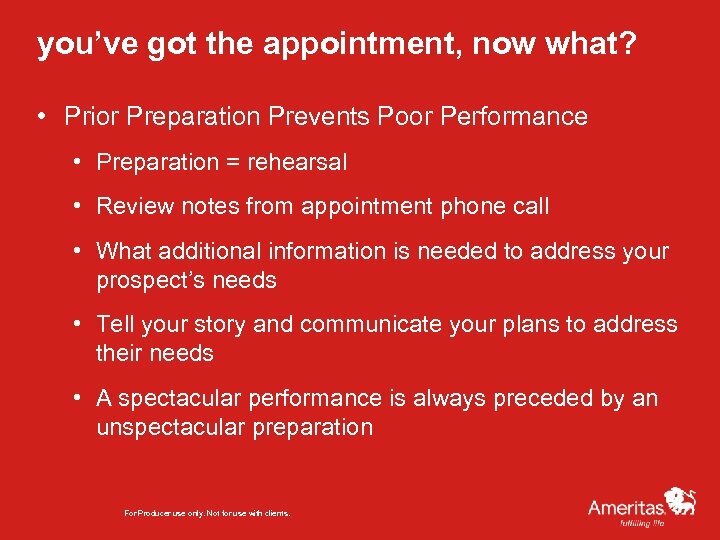 • Prior Preparation Prevents Poor Performance • Preparation = rehearsal • Review notes from appointment phone call • What additional information is needed to address your prospect’s needs • Tell your story and communicate your plans to address their needs • A spectacular performance is always preceded by an unspectacular preparation For Producer use only. Not for use with clients. 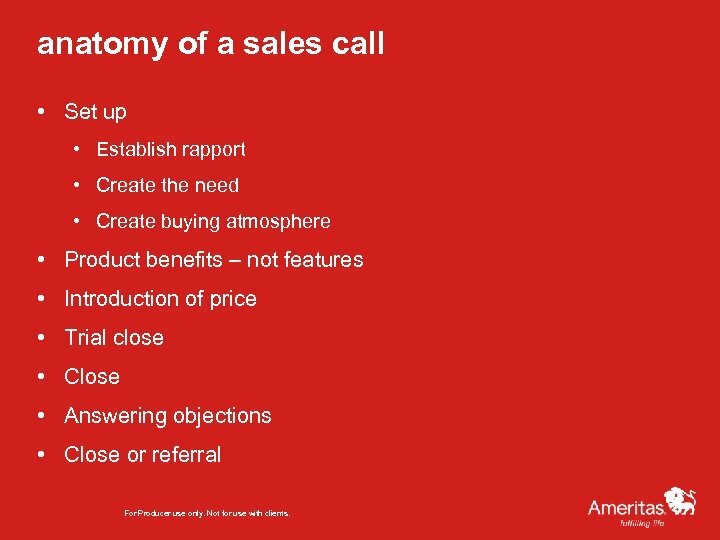 anatomy of a sales call • Set up • Establish rapport • Create the need • Create buying atmosphere • Product benefits – not features • Introduction of price • Trial close • Close • Answering objections • Close or referral For Producer use only. Not for use with clients. 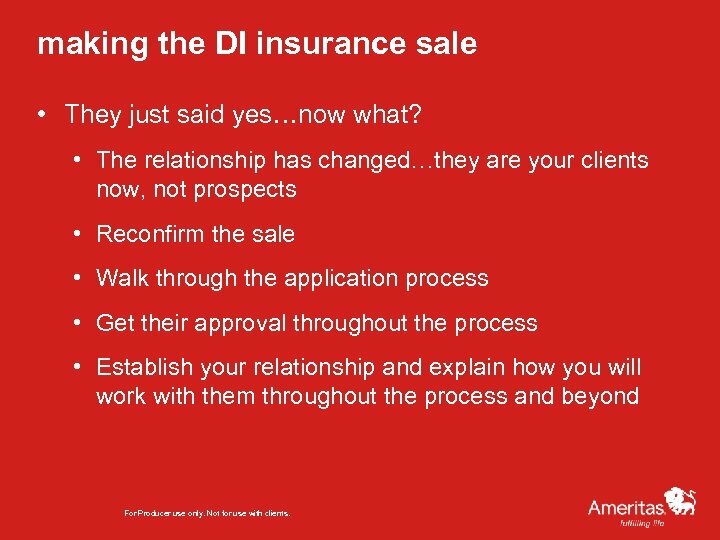 making the DI insurance sale • They just said yes…now what? • The relationship has changed…they are your clients now, not prospects • Reconfirm the sale • Walk through the application process • Get their approval throughout the process • Establish your relationship and explain how you will work with them throughout the process and beyond For Producer use only. Not for use with clients. 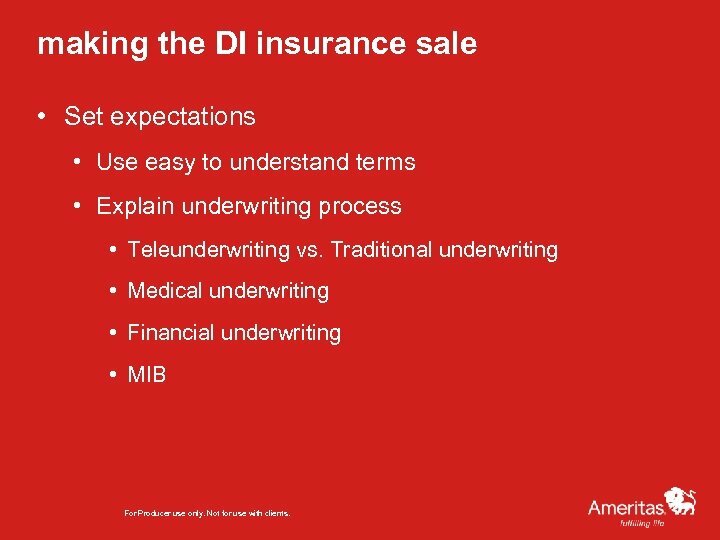 making the DI insurance sale • Set expectations • Use easy to understand terms • Explain underwriting process • Teleunderwriting vs. Traditional underwriting • Medical underwriting • Financial underwriting • MIB For Producer use only. Not for use with clients. 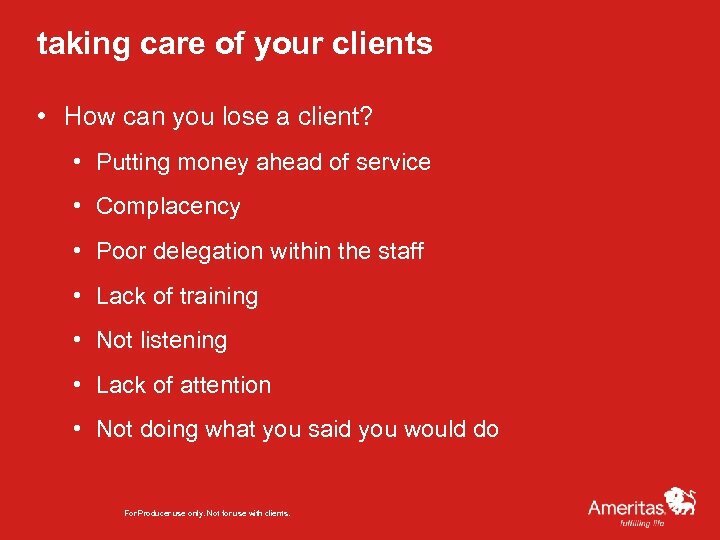 taking care of your clients • How can you lose a client? • Putting money ahead of service • Complacency • Poor delegation within the staff • Lack of training • Not listening • Lack of attention • Not doing what you said you would do For Producer use only. Not for use with clients. 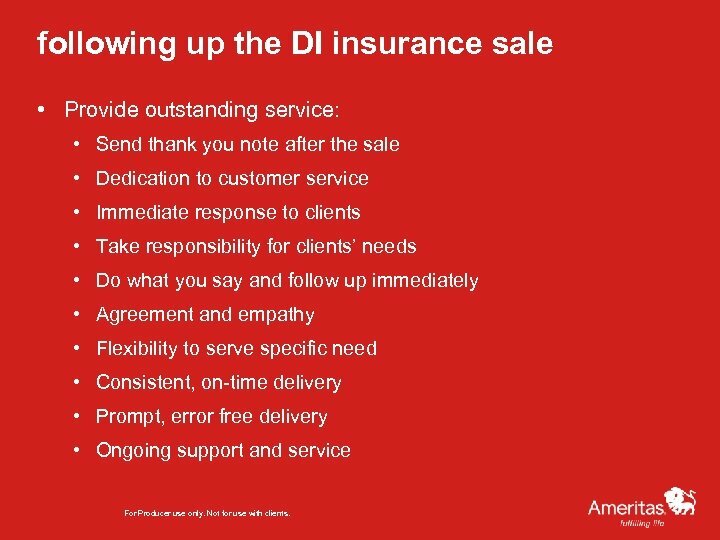 following up the DI insurance sale • Provide outstanding service: • Send thank you note after the sale • Dedication to customer service • Immediate response to clients • Take responsibility for clients’ needs • Do what you say and follow up immediately • Agreement and empathy • Flexibility to serve specific need • Consistent, on-time delivery • Prompt, error free delivery • Ongoing support and service For Producer use only. Not for use with clients. are you committed to your success? • Get and keep a positive attitude • Set goals and commit to achieving them • Dedicate yourself to mastering the science of selling • Design and implement a networking plan • Be a leader • Get involved in your community For Producer use only. Not for use with clients. are you committed to your success? 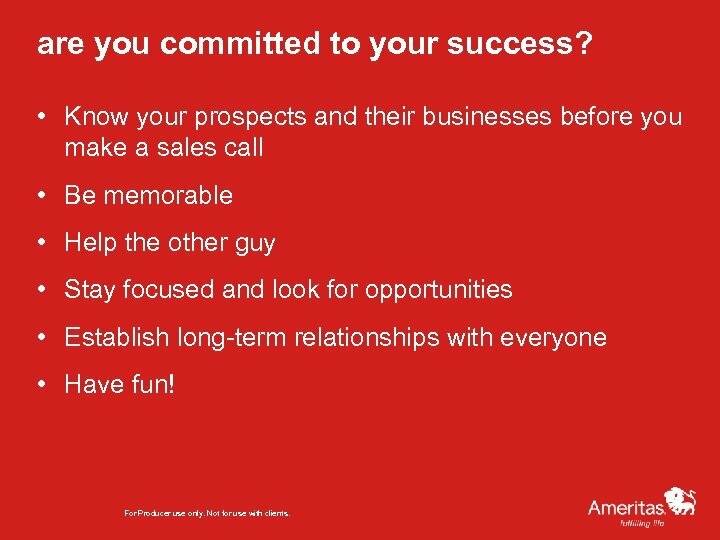 • Know your prospects and their businesses before you make a sales call • Be memorable • Help the other guy • Stay focused and look for opportunities • Establish long-term relationships with everyone • Have fun! For Producer use only. Not for use with clients. 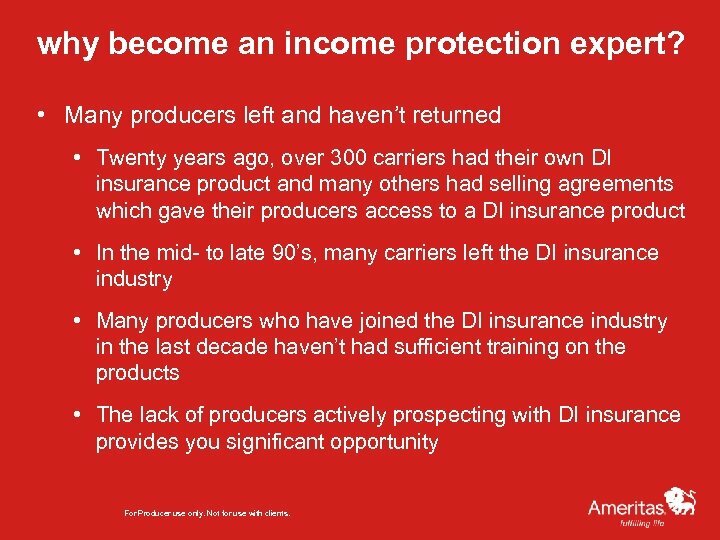 DI insurance compensation – Ameritas® For Producer use only. Not for use with clients. 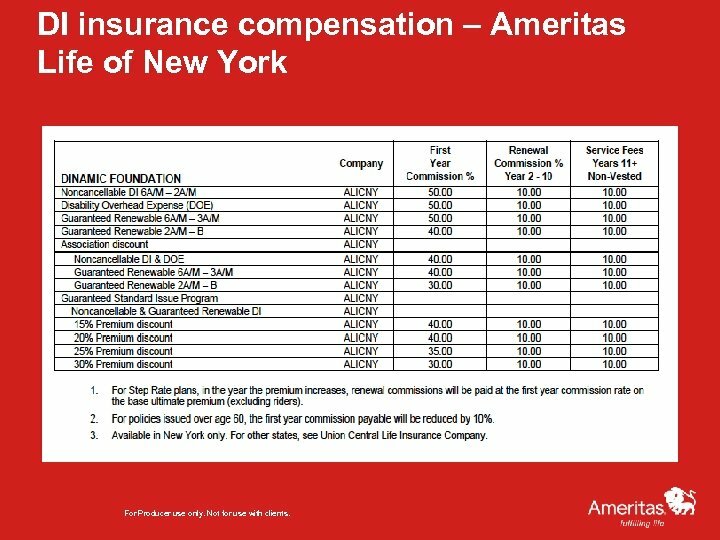 DI insurance compensation – Ameritas Life of New York For Producer use only. Not for use with clients. 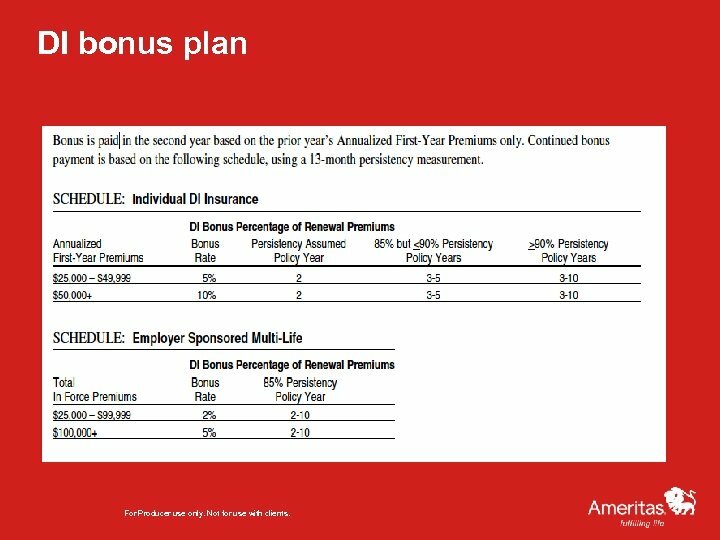 DI bonus plan For Producer use only. Not for use with clients. 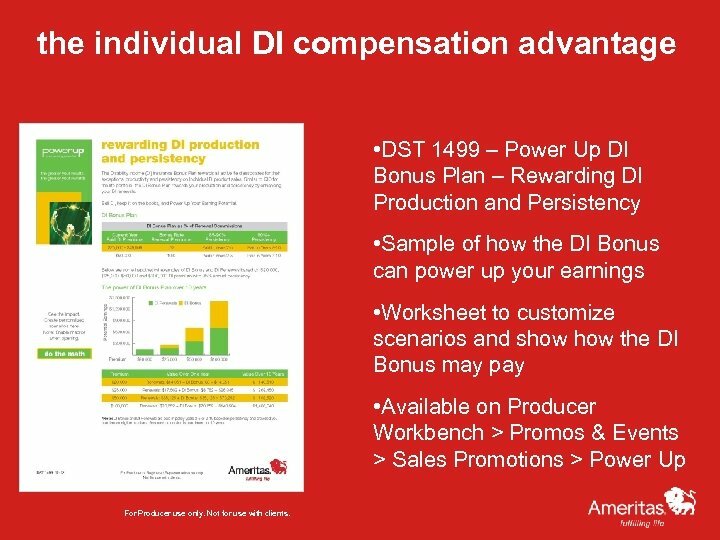 the individual DI compensation advantage • DST 1499 – Power Up DI Bonus Plan – Rewarding DI Production and Persistency • Sample of how the DI Bonus can power up your earnings • Worksheet to customize scenarios and show the DI Bonus may pay • Available on Producer Workbench > Promos & Events > Sales Promotions > Power Up For Producer use only. Not for use with clients. 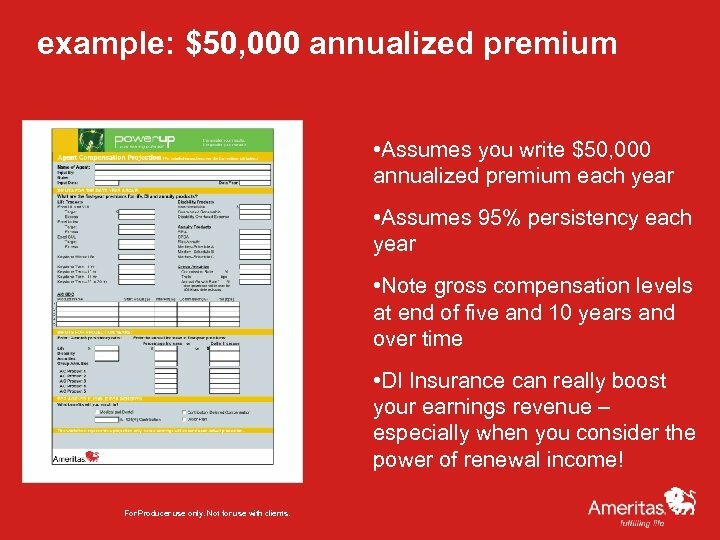 example: $50, 000 annualized premium • Assumes you write $50, 000 annualized premium each year • Assumes 95% persistency each year • Note gross compensation levels at end of five and 10 years and over time • DI Insurance can really boost your earnings revenue – especially when you consider the power of renewal income! For Producer use only. Not for use with clients. 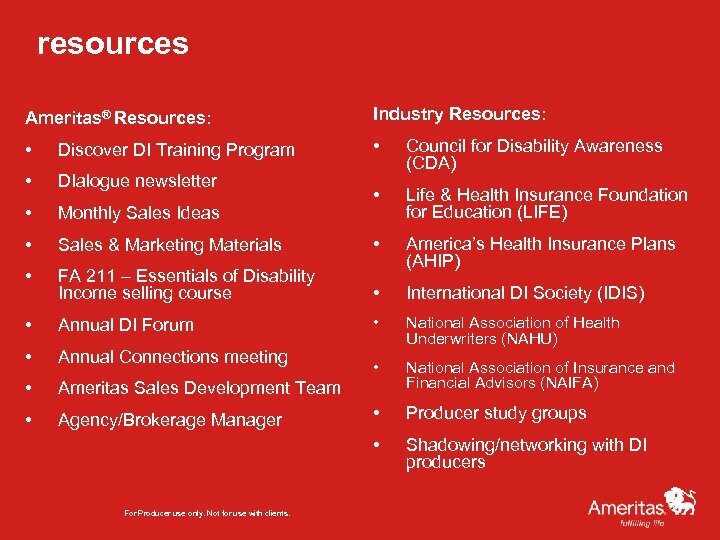 resources Ameritas® Resources: Industry Resources: • Discover DI Training Program • • DIalogue newsletter Council for Disability Awareness (CDA) • Monthly Sales Ideas • Life & Health Insurance Foundation for Education (LIFE) • Sales & Marketing Materials • • FA 211 – Essentials of Disability Income selling course America’s Health Insurance Plans (AHIP) • International DI Society (IDIS) • Annual DI Forum • • Annual Connections meeting National Association of Health Underwriters (NAHU) • • Ameritas Sales Development Team National Association of Insurance and Financial Advisors (NAIFA) • Agency/Brokerage Manager • Producer study groups • Shadowing/networking with DI producers For Producer use only. Not for use with clients. 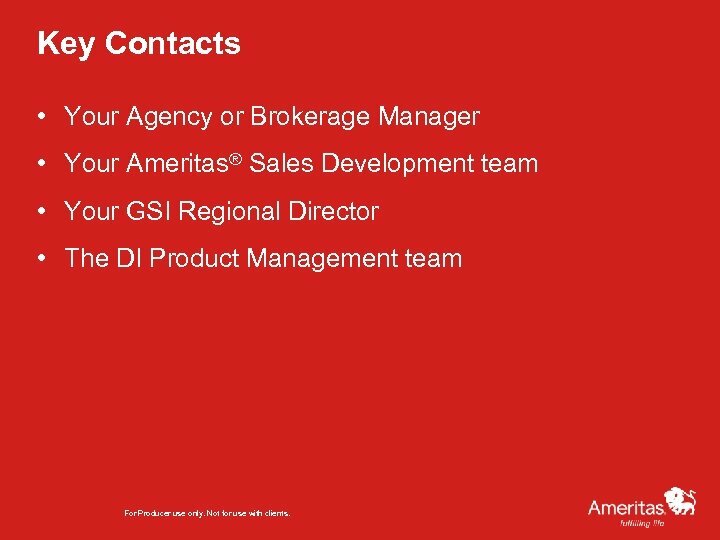 Key Contacts • Your Agency or Brokerage Manager • Your Ameritas® Sales Development team • Your GSI Regional Director • The DI Product Management team For Producer use only. Not for use with clients.